“The true measure of a man is how much he would be worth if he lost everything.” – Unknown. Your worth and value doesn’t come from the car you drive, what you have or where you live. It is inherent, intrinsic, and cannot be taken from you. It is reflected in your character, the way you live your life and the way you treat other people. I have seen numerous YouTube videos lately where events are staged to look like someone is out on the street and down on their luck or having a hard time where they really need some help out in public. I have been highly disappointed in the vast majority who just walk on by, ignoring them, even when the person has been face down in the middle of a busy sidewalk. 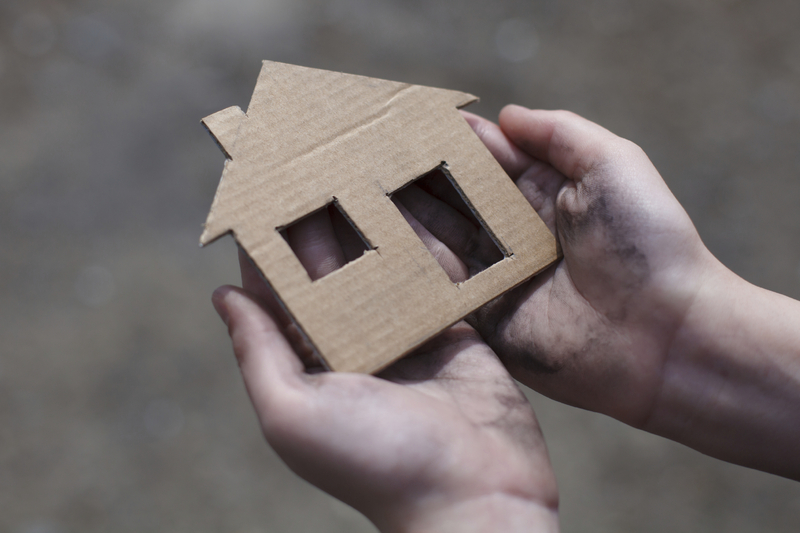 Many of the bystanders who actually do come to the aid of that person have been homeless themselves and have the very least to give (monetarily). What does this say about our society? Have many of us become so jaded that we can’t see what is right in front of us; our fellow human beings in need of help. Is it that we don’t care? Don’t feel one person can make a difference? I don’t really have an answer for that. What I do know is that we are all connected. Treating someone as if they do not matter is unacceptable. Everyone matters. We need to stop judging on appearance. Look past the surface; clothing, hair, skin color, or whatever it is that is keeping us back from looking into that persons eyes and seeing another living breathing human being. This is a two-sided coin. On the other side of that, how do you deal with people when you don’t have a place to call home or sometimes even food to eat? Feeling badly or ashamed of your situation or worse about yourself, won’t help things. Our current situations in life are always an echo. They are a combination manifestation of our past thoughts, actions and happenstance. Dwelling on it will likely push that echo on to the future and get you more of the same. Breaking free of this cycle isn’t an easy thing to do, for any of us, and being in a bad situation currently does make it harder so please don’t think I am discounting that. Acceptance of where you are now is the first step because the fact is – you are where you are regardless of what you think or how you feel about it. Take a good look around you. Life is all about perspective no matter what you do or don’t have. Rich or poor. They both are a state of mind that projects outwardly and into your reality. Take stock of what you do have that is good in your life. Friends, Family, a pet, a nice place to rest, a sunny day, anything that brings even the slightest joy to your life. Focus on that which makes you feel good or even a little bit better. Do your best to ignore the rest. The truth is that when you live in gratitude for what you already have, however perceived little it may be, more will come into your life to be grateful for. All of us are infinitely valuable, more so than we realize. We all individually have the power to touch someone’s life. Make sure you do so in a positive way, even if it’s just with a smile or kind word. The perception of wealth has mistakenly become all about what we have and what we can get on a material level. True wealth is measured in richness of life and of the heart. It is boosted not by what we get but by what we give and whom we help. You don’t have to be well off financially to give of yourself. In many social experiments it has been found that those who have the least tend to give the most because they know what it is like to go without. A few years back I came across a book that I haven’t been able to forget. 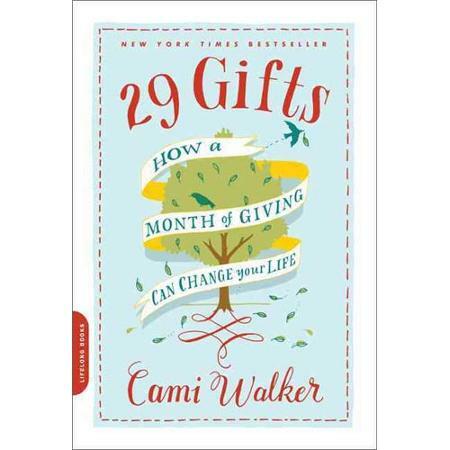 “29 Gifts – How a Month of Giving Can Change Your Life” by Cami Walker. “I’m going to end up in a wheelchair… My life is over. Then, as a remedy for her condition, Cami received an uncommon prescription from a friend, an African Medicine Woman named Mbali Creazzo. The prescription was simply to give away 29 gifts in 29 days. The gifts, she said, could be anything, but their giving had to be both authentic and mindful. At least one gift needed to be something she felt was scarce in her life. Cami was amazed by what unfolded during her month-long journey. Not only did her state of mind improve but her health did as well. I myself will be doing this challenge starting July 1st, 2015. I would like to invite you, our readers, to join me. Gifts can be anything including a nice gesture – those are free and we never run out. This world needs more kindness. If we want the world to change, we have to start with ourselves. The fascination we, as a society, have with observing other peoples lives from the sidelines has gone from merely entertainment to crossing the line of dangerous passivity. Reality TV has given us all a voyeuristic window into the lives of others that has never been had in the past. There have always been nosy neighbors and gossips but now you don’t even have to get together with your friends, or even go out of your house. Just flip on the little box in your bedroom, living room, TV room, even bathroom and you can see in full color the drama and strife of other peoples daily lives. No more need for writers, actors or even talented people at all. The only qualification seems to be vanity, a need for attention and to be vaguely attractive. Are you a total hot mess with a seriously screwed up life? Great! Video yourself, upload and apply! We can make you famous! This is blurring the lines of reality. Apparently all of it and all the better if you happen to be able to capture someone doing something on your phone so you TOO can profit from it, whether it be monetarily or through the second hand attention of “likes” and praise online with YouTube or social media. When did it become funny to watch people hurt themselves over and over and over again? Yet I bet if it was you? You wouldn’t think it was so funny. I have seen numerous videos online lately of incidences where someone is being harassed, hurt, injured or worse and what do the by standers do? Live up to the name. They do nothing but stand by and film. -Crowds of people gathered around young kids while others beat them, no one steps in to help. -Adults throw temper tantrums at fast food restaurants, screaming obscenities at the workers – no one opens their mouths to try and get them to either calm down or leave, they just whip out their phones and record the abuse. -In the Knockout Game, random strangers are simply hit out of no where. There are almost always several other people in the videos who again, just stand there. They don’t say a word, they don’t yell at the attacker, they don’t make any move to go after him and rarely do you even see them grab their phone to call for help. -Police step over the line in arrests brutalizing citizens who are already down on the ground and compliant. Their friends just film. While I do understand the natural inclination is to not want to be involved in a fight, you really need to consider – What if it was you? Would you hope your friends, your family, a caring stranger, anyone would step in? Do something, say something, … ANYTHING? I certainly would appreciate it. I don’t advocate jumping right in to a fight if you are not trained. What I am saying is speak up! Use your voice. Grab their arm. Make SOME attempt to slow them down, insert a little reason in to the scene. Don’t just passively sit there and watch it happen. If you do, you BECOME part of the problem. Let me say this as clearly as possible. We are quickly losing our humanity. How would you feel? Down to your last dollar, no money for rent, no place to keep your possessions – what you have left anyway, and no one to turn to who will help you. Out on the street. Strangers that once smiled at you as you pass by now look away purposefully out of uncomfortability and shame. You are now a non-person. Looked at as some how a lesser being. Are you not the same person you were a few months ago? You are – but that’s not what people now see. Why won’t they look at you? – Fear? Disgust? Anger? Do they think you are lazy? That you did this purposefully as a life choice? Or are they afraid that someday it might be them? 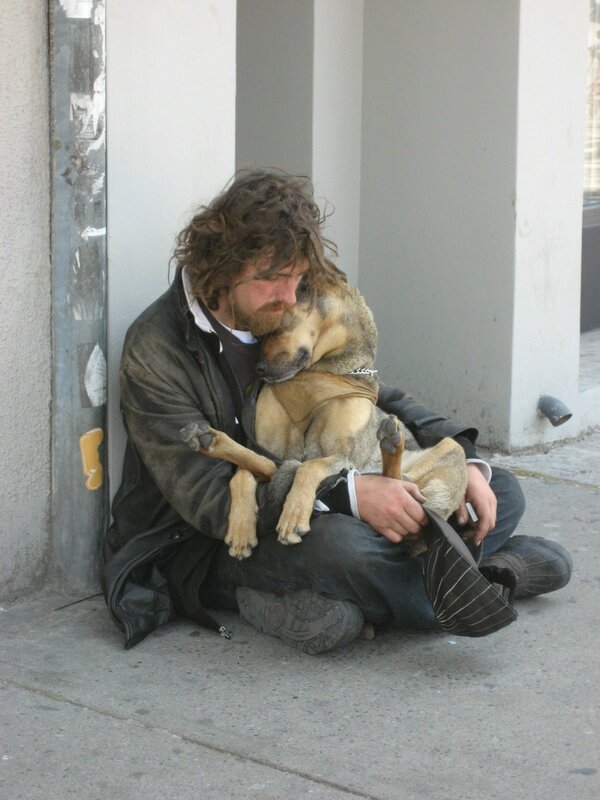 There is no way to know for sure and everyone has his or her own individual reaction to the homeless. Economic times are tight… Many of us are just squeaking by as it is, even if fully employed. We cannot always help as much as our hearts tell us too. For many the easiest way around that is to avoid dealing with them all together. Don’t look at them and they don’t exist – right? Doesn’t work that way. They are there and they are real. They need help. Every act of kindness will help to raise the vibration of this world from selfishness and greed to one of generosity and strength. If you have an extra dollar, share. If you don’t – at the very least make eye contact and smile like you would any other person. Dignity doesn’t carry a price tag.